John Alvin Helm born June 21 1900 His birth mother’s name was Pam. Alvin was born out of wedlock, Pam married a Mr. Rinke and they were all quite happy until they had children of their own. Alvin’s stepfather mistreated him. One day his stepfather and brother got into a fight and his stepfather killed his brother. He was sentenced to life in the penitentiary. The poor mother had so many children. My mother Karolina Schaffer felt sorry for Alvin as he was the oldest and only five years old. Karolina’s first husband Philip George had recently passed away and she was alone. Alvin went to live with Karolina, he was a big help to her. When Karolina married Karl Helm, they adopted Alvin as their own. 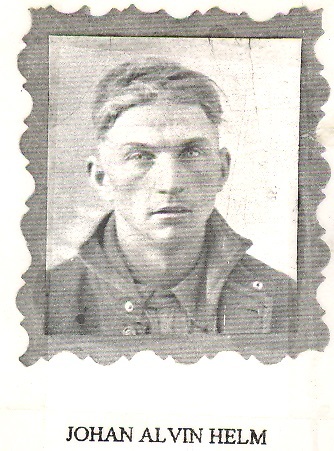 Alvin said he had a happy life until Karl Helm died and mom married Otto Deering. Alvin always wanted to be a cowboy and when he was 16 years old he left home. 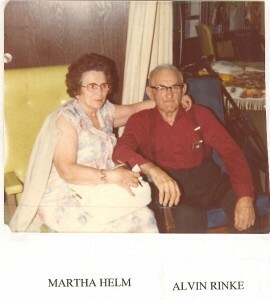 Alvin went by the name of Alvin Deering and later changed his name to Rinke.